More than 8,700 lawsuits are now pending against Monsanto over the glyphosate-based weed killer. Another lawsuit is set to go to trial in St. Louis in October 2018. 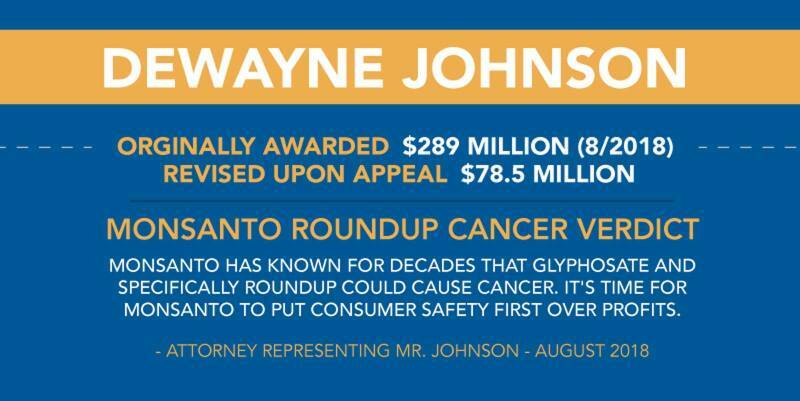 August 10, 2018 (upheld October 2018, but verdict reduced) – San Francisco jury orders Monsanto to pay $289 million in damages to Dewayne Johnson, the 46-year-old school groundskeeper diagnosed with terminal non-Hodgkin lymphoma, who used Roundup more than 30 times per year to spray the fields while working. The jurors deliberated for over two hours before finding that Mr. Johnson’s cancer was at least partly due to glyphosate exposure — the main ingredient in the popular weed killer. This was the first lawsuit alleging glyphosate causes cancer to go to trial. Plaintiff’s attorneys noted that this verdict was a “day of reckoning” for Monsanto. This landmark verdict survived appeal in October 2018 but the California judge decreased the punitive damages won taking the total verdict awarded to groundskeeper DeWayne Johnson $78.5 million. Judge Bolanos limited the award based on his reading of a Supreme Court case that requires a one-to-one ratio between compensatory and punitive damages. Since the jury awarded Johnson $39.25 million in compensatory damages, Judge Bolanos reduced punitive damages to match that amount. Judge Bolanos also noted that it was reasonable for the jury to conclude that Monsanto acted with malice by continuing to market and sell a dangerous product without a warning. Monsanto continues to deny the link between glyphosate and non-Hodgkin lymphoma. Monsanto Roundup Lawsuits received the court’s blessing to move forward! The Honorable Vince Chhabria, the federal judge in San Francisco, ruled in favor of the thousands of individuals diagnosed with non-Hodgkin’s lymphoma as a result of Roundup use. Monsanto requested to dismiss cases but Judge Chabria held that plaintiffs’ put forth reliable scientific evidence that exposure to Monsanto’s Roundup weedkiller can cause cancer. We look forward to giving our clients should their day in court! Roundup Weed Killers, the popular herbicide manufactured by Monsanto, is the subject of Roundup lawsuits alleging non-Hodgkin’s Lymphoma, according to a 2015 report from the International Agency for Research on Cancer (IARC), a division of the World Health Organization. Roundup Weed Killers is a herbicide that kills broadleaf plants and grasses when applied to the leaves of the plants. Roundup is the world’s most widely used herbicide and the second-most popular weed killer for residential yards and gardens, according to National Geographic. Introduced by Monsanto in 1974, Roundup’s popularity increased dramatically in the 1990s when Monsanto introduced “Roundup Ready” crops that were genetically engineered to resist the herbicide so that farmers could apply it liberally on entire fields. Two nonprofit groups, Beyond Pesticides and the Organic Consumers Association, recently filed a lawsuit against Monsanto alleging that its glyphosate-based product, Roundup, is mislabeled as targeting an enzyme found in plants but not in people or pets. The lawsuits charge that Monsanto knows its representations are false, yet chose to profit off Roundup rather than warn consumers of the health risks associated with the chemical. More than 8,000 cancer lawsuits are now pending against Monsanto, filed by individuals who allege that they developed non-Hodgkin’s lymphoma because of glyphosate exposure. The weed killer is also being added to California’s Proposition 65 list of chemicals known to cause cancer. Proposition 65 is a right-to-know California law that voters approved in 1986. It requires the state to maintain a list of chemicals known to cause cancer, birth defects, or other reproductive harm but does not ban or restrict the use of listed chemicals. However, it does require businesses to provide warnings prior to causing a significant exposure to a listed chemical, and also prohibits discharges of the chemical into drinking water sources. In October 2016, 21 Roundup lawsuits pending in fourteen districts were consolidated into multidistrict litigation in the Northern District of California. The lawsuits, filed primarily by agricultural and landscape workers who used glyphosate for an extended period of time, make similar allegations, including that Monsanto knew or should have known about the link between Roundup and non-Hodgkin’s Lymphoma, yet failed to provide proper warnings and instructions about safety measures that should be taken to reduce exposure to glyphosate contained in the popular weed killer. Many states have a two-year statute of limitations allowing individuals to file a lawsuit two years from the date on which the learned of a possible health connection with a particular product, and given the March 2015 release of the IARC report and the fact that the deadline is looming, cases continue to stream in. Between state and federal courts, hundreds of Roundup lawsuits have been filed in the U.S. WARNING! International Agency for Research on Cancer (IARC) links exposure to glyphosate to non-Hodgkin lymphoma. BANNED! The following countries have banned Roundup – Malta, Sri Lanka, Netherlands, Argentina and France. If you were exposed to Roundup and later developed non-Hodgkin’s Lymphoma, you may be eligible for compensation.